David Sarasohn is associate editor of The Oregonian in Portland. 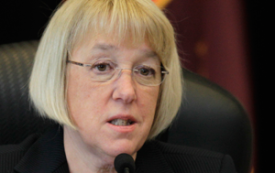 With a two-seat gain while chair of the DSCC and a successful effort to get a budget through the Senate under her belt, Patty Murray has become a major force in the Senate. In four close Western races, the tribal population could tip the balance. When Attorney General John Ashcroft felt obliged to go out campaigning in August in defense of the USA Patriot Act, his problem wasn't just what people were saying about the act. Tony Hall, just before leaving Congress in September, sat in his office in Longworth House Office Building and thought of something that had stuck with him since a trip to Appalachia.